Valon Rachius was born 260.02 in a military hospital in the capital of Anaxes. His father, Romel, was an accomplished naval officer that had served in the Commonwealth War of Secession and his mother was a former servant of one of the Anaxsi generational families. The middle child of three, Valon was a well-behaved youngling and avoided the squabbling of his younger sister Ardemia and older brother Maurus. Following Master Romel’s retirement from the Galactic Alliance Fleet, the family moved from Pols Anaxes to one of its suburbs, and lived comfortably for several years. The Rachius children were instructed in basic subjects by middle class tutors and of the Anaxsi virtues of duty and equality by their loving parents. Prior to their enrollment in public school, Valon and Ardemia were discovered to be Force sensitive from their blood samples. After the Jedi Watchman of the Azure Sector was informed, he paid a visit to the Rachius home and spoke with the younglings’ parents about the possibility of their children beginning Jedi training offworld. Mister and Missus Rachius permitted their children to be taken, and they were brought to the Jedi Temple on Coruscant. The Council decided that in order to be weighed fairly, the siblings would need to be separated. Ardemia was taken to the enclave on Arkania while Valon was sent to the praxeum of Yavin IV. On the forest moon, Valon became fast friends with a sickly Togrutan boy named Z’phos. Their friendship carried them through to both of their initiations, which both occurred on 268.08, and beyond. Young Rachius’ training began slowly and continued, the boy’s strongest proficiency growing to be his skill in deflecting with a lightsaber. After the early instructional period had passed, Jedi Knight Moza Ferorn took Valon Rachius as his apprentice on 269.19. The Ithorian began training his Human pupil immediately. Ferorn instructed Valon in the use of the Force’s subtle applications and uses, and trained the boy to open more fully to the Force’s power. As his senses grew, Master Ferorn refined them by sharing his insights on ethical applications of Force powers through simple scenarios and hypothetical situations. To balance out the intellectual study, Valon was made to keep vigilant by constant ambushes by his Master’s lightsaber blade and was taught to defend himself in rough simulations permitted by the praxeum’s holocomputer. Training went smoothly until the pair became involved in the investigation of a Dark Side cult calling themselves the Dark Advocates. In the middle of this assignment, their assisting investigator was mysteriously killed. Linking the murder to the Advocates, Master Ferorn and Padawan Rachius tracked the group to a facility on Tatooine but were discovered and ambushed by the cultists. Valon was injured in the battle that followed and returned to Yavin IV troubled. Though he recovered from his wounds, he expressed conflict with Master Ferorn and requested to be transferred to the Jedi Medical Corps near the end of that year, on 271.20. Serviceman Rachius spent eight years in the Corps, his assignments taking him to planets from all sides of the Outer Rim and within the Core. 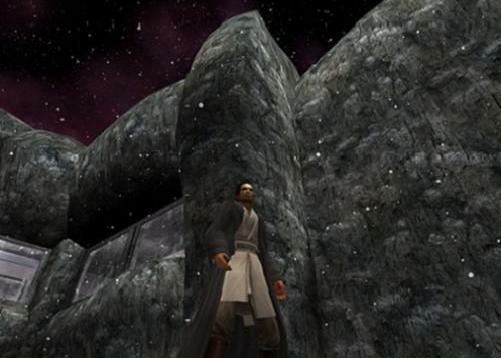 His work was overseen by Jedi Master Melv Balmora of Bespin, who also met with Valon for regular therapy. After almost a decade in service, Valon requested to return to Yavin IV and his request was granted. Shortly after returning to Yavin’s fourth moon, a Mandalorian force assaulted the praxeum, forcing the Jedi and Valon to flee. Their exodus took them first to Tatooine, and then to Kamino where they lived in the residence of one of the Order’s artisans. Councilman Arkallon met with Valon here, and discussed with him his past and future among the Jedi. Padawan Rachius was reinstated 279.26 and a day later, he was unexpectedly taken by Jedi Master Jamus Kevari, Valon’s old lightsaber instructor, as his apprentice.